There are so many differences between the Northern and Southern Rhone Valleys that they should almost be called completely different names. Almost the only thing in common as I mentioned in my last post, is the fact that the four varieties grown in the north are also grown in the south. The Northern Rhone is a much more narrow and elevated valley than in the south, which opens up into wide plains with rolling hills rather than steep cliffs. This type of land actually reminds me of the way the Adige River flows south from Austria through the Italian Alto Adige and Trentino regions into Veneto. Secondly the amount of vineyards in the Northern Rhone is 3,000 hectares, which is the same amount as Chateauneuf-du-Pape alone, one single appellation of almost ten in the Southern Rhone. Thirdly the general approach for the Southern Rhone is for volume rather than quality, particularly for the Cotes-du-Rhone appellation, and there are only a few which go for quality above all else. In the Northern Rhone there is really only one appellation of eight that is more geared towards volume and compared to the Southern Rhone would be considered one of the quality appelations. In the Southern Rhone there is significantly more wine blended between areas than in the Northern Rhone, not to mention a great many more varieties blended, whereas in the north they really only use four and never blend more than two together. Probably the biggest difference is the amount of wine produced by cooperatives, much of which is sold to negociants within the Rhone Valley or outside of it and then bottled by someone else. 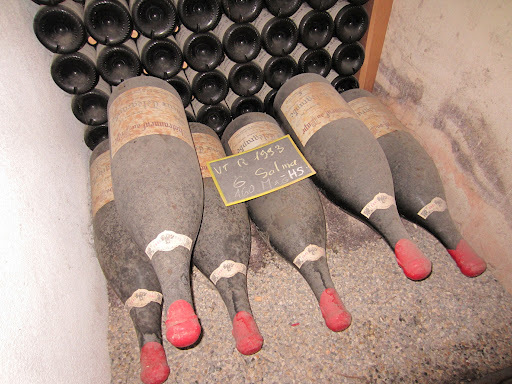 Very rarely does wine get sold in bulk in the north; it is either sold as grapes or bottled wine. The first appointment I had for today was a negociant producer owning no vineyards (Tardieu-Laurent), and the other was the opposite, only producing wine from their vineyards in the Southern Rhone Valley (Vieux-Telegraphe). 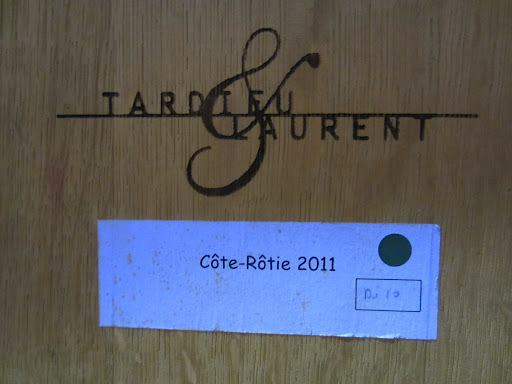 Tardieu-Laurent hasn’t been around as a wine brand for long, only being established 20 years ago. This doesn’t mean that the partners of the winery weren’t capable of producing exceptional wine, albeit in a slightly different model. 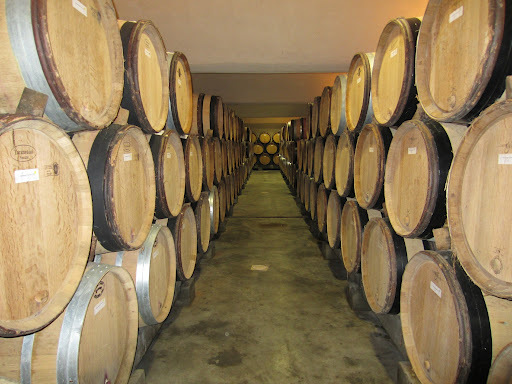 As a negociant producer, they only purchase wine from suppliers in the Northern and Southern Rhone Valley, which is then transported to their cellars in the deep south to be matured in barrels (as necessary), bottled and then distributed to their markets. Over the years they have been able to engage some excellent growers that consistently provide them with fermented and stable wines to blend. The model of only buying wine each year rather than growing and processing fruit themselves gives them a great deal of flexibility, as they can reject wines if they don’t meet their high standards, or engage more suppliers in strong vintages or as the brand grows. It does also mean that they cannot completely control the cultivation of the grapes themselves, nor the selection and fermentation of the fruit. It also means that the costs are more variable and theoretically expensive than if they had their own vineyards, although vineyards take investments in time, money and human resources. 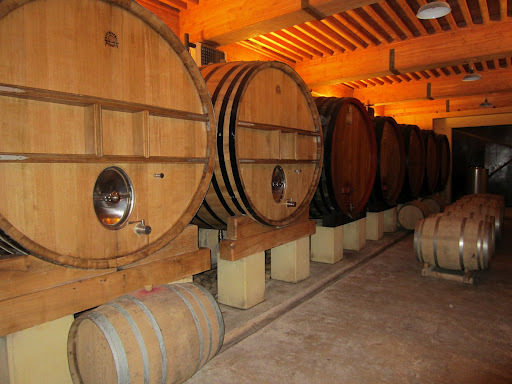 The fact that the former partner of the business was esteemed Burgundy negociant Dominique Laurent helped establish strong relationships with suppliers, and is part of the reason that so many growers are honoured to sell their wines to them to be bottled under the brand name. The estate is now owned and operated solely by the Tardieu family, under the watchful eye of Michel Tardieu. The winery works with growers in almost all the appelations of the Rhone Valley, which is fantastic for the range and variety of wines, but also to gain experience in so many different terroirs. Bastien Tardieu, the second generation to come through and join the business as the oenologist, showed me the 2010 vintage still in barrel, as we also discussed his experiences working vintages in Australia for the likes of Torbreck. It was fantastic to see all the appelations from the same vintage to show how they differ, particularly from a good producer where the quality is always high. Click here to read my tasting notes from Tardieu-Laurent. Sometimes when I visit wineries on my trip, I am fortunate enough to meet some pretty important people who create a sense of humility over me, almost to the point that I am afraid to express my opinions lest I look ignorant. These people are more often hosts like Luciano Sandrone, Olivier Humbrecht or Fritz Hasselbach, but sometimes they are people I am joining on a visit. One such person was Peter Scudamore-Smith, one of the 18 Masters of Wine from Australia, who I was lucky enough to meet when I visited Domaine de Vieux-Telegraphe. Peter is known to be an expert particularly in Italian wines, has visited Italy countless times, and the week before had been with a group of other MWs in Sicily. I was very surprised to hear that this was his first visit to the Rhone Valley, but also excited to hear that after many years bringing groups to Italy, he is planning to start bringing groups to French wine regions. I was a little bit in awe of his oenological knowledge as we were taken through the winery and a tasting with our host, Mendozan-born cellarmaster, Leo Borsi. The name Vieux-Telegraphe is taken as you may have guessed, from the telegraph station that sat on top of Chateauneuf-du-Pape hill where the domaine is now located. The hill of Chateauneuf-du-Pape has a 360 degree view of many kilometres away, making it an ideal place for a telegraph station, and the top of the hill is coincidentally the best place for vineyards as I mentioned in a previous post. Hippolyte Brunier planted vines on the Le Crau plateau in 1898, and it was his son who named the domaine after the telegraph tower. The domaine only has vineyards on the plateau, 70 hectares of them, which is very unique in the appelation. The Vieux-Telegraphe Rouge is the centrepiece of the winery, and has been for nearly a century, and rather than produce a super cuvée as some other estates have in the region, they created the Vieux-Telegramme to further improve the quality of the first wine. White wines are also produced under the Telegraphe name, and the Brunier family now own a second Chateauneuf estate called Domaine de la Roquette, and an estate in Gigondas called Domaine de Pallieres. 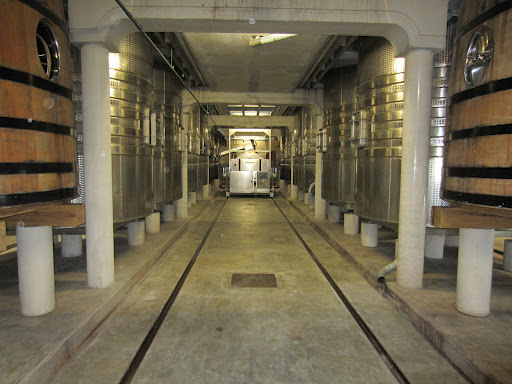 The winery has recently had some major works and expansion conducted, not to increase production but to create more working space and flexibility. After a tour we were taken through a range of the wines from all three estates, which varied in quality somewhat; some were outstanding and others less than inspiring. Click here to read my notes on the wines. Click here to see more photos from Day Two in the Rhone Valley, France. Next time I head from North to South in one day.